Artisan Wood Fired Pizza for your Event, Party, Festival, Fair or any occasion. 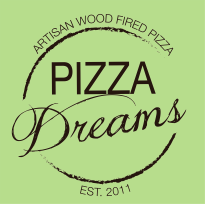 Pizza of Dreams, the home of Mobile, Artisan, Wood Fired Pizza. Imagine fresh dough stretched in front of you, your choice of quality ingredients on top. The smell of the wood fire in our traditional clay ovens as your Pizza is bubbled and sizzled to perfection. And your amazement as just 90 seconds later, probably the freshest and best tasting Wood Fired Pizza you have ever had emerges from our vintage Pizza trailer to delight your tastebuds! That is truly a Pizza of Dreams.